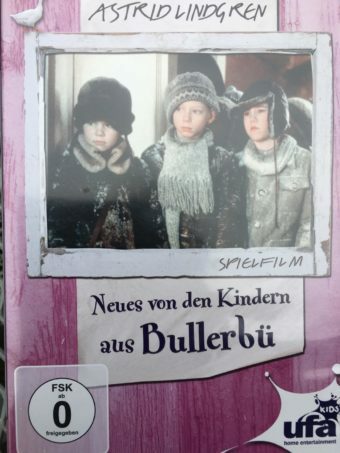 Now the dark evenings are here and we’ve been watching two bright, warm-hearted films in German: “Wir Kinder aus Bullerbü” and its sequel, just as enjoyable, “Neues von den Kindern aus Bullerbü”. 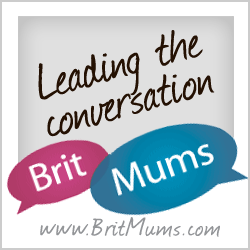 They’re great for any time of year but especially from November onwards, when it’s 4 in the afternoon, the kids are home from school or preschool activities…and it’s dark and cold outside. I’ve always found it a bit sad when we turn back the clocks and my daughter can’t enjoy the garden or the park after school. The answer is to make yourselves cosy and turn it into an opportunity for hygge! Click here to read about how we recreated hygge at home last winter, a bit tongue in cheek. It’s especially relevant here, as the films originate from Scandinavia. The two films closely follow the book “Alla vi barn I Bullerbyn” written by the famous Swedish author Astrid Lindgren. 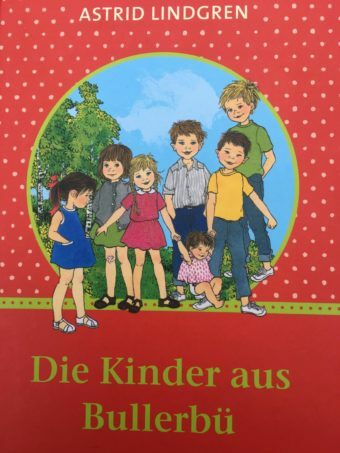 The book was translated into German as “Die Kinder aus Bullerbü” by Else von Hollander-Lossow and Karl Kurt Peters. As all too often with older books, you have to hunt for the translators’ names written in tiny print inside the book. Astrid Lindgren (1907- 2002), is most famous for her lively stories about Pippi Langstrumpf (Longstocking). 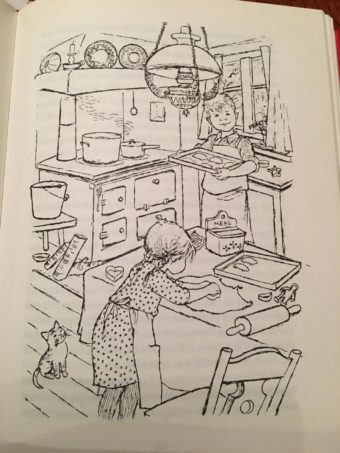 We’ve followed the adventures of Pippi too, as she undertakes all sorts of mischievous, risky things living alone in a big house with her pet monkey and horse (as you do). You can read the Pippi books or watch the Pippi films. Unlike the Pippi books, Astrid’s book about the children of Bullerbü is little known in the UK. It’s actually available in Oxford University Press paperback, translated from Swedish into English by Susan Beard in 2014 and illustrated by Tony Ross. The English title surprises me: The Children of Noisy Village. 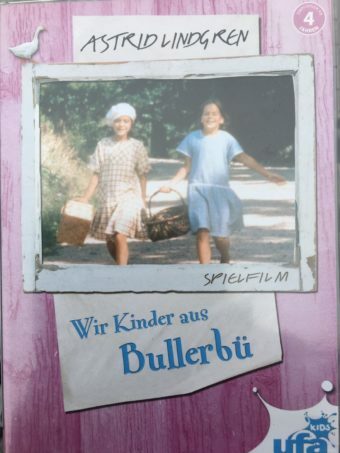 My daughter has always preferred Bullerbü to Pippi as she liked to imagine herself right there in the Swedish countryside, playing with the children. She was never quite sure about taking part in the more extravagant adventures of Pippi, like jumping off a cliff, landing on some jagged rocks and still being ok. Don’t try this at home, kids! 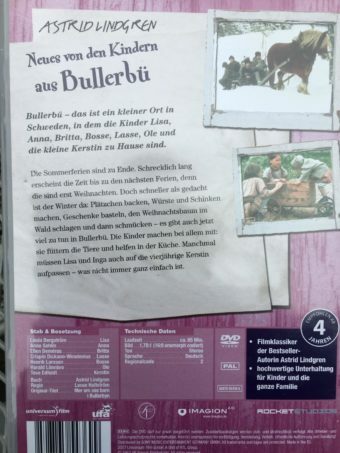 The Bullerbü book has been turned into two films, made in Swedish by director Lasse Hallstroem in 1986/7. You can watch the DVD in the original Swedish or in very convincingly dubbed German. There seems to be no English version anywhere. The films are both 1h 30m long and certificate U. 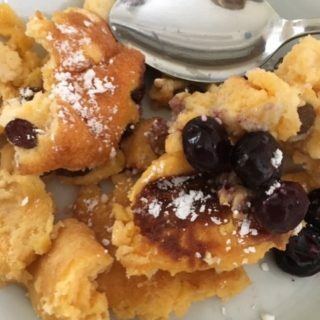 They can be enjoyed by everybody from age 3 and a half upwards. My daughter started watching them at that age and still loves them now, aged 13. She’s seen them so often that she can still put the words into the actors’ mouths. 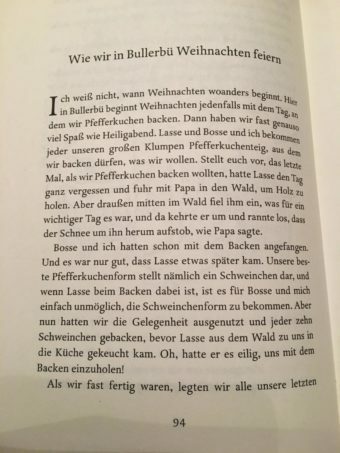 That’s how you learn more German. There are only 3 houses in Bullerbü, a fictitious hamlet based on Sevedstorp in Smaland, Southern Sweden, where Astrid’s father grew up. We follow the children’s idyllic rural adventures narrated by the soothing voice of 7 year-old Lisa. I always feel that she’s talking directly to us as we lounge on the sofa. There are 3 farmhouses in the hamlet, and Lisa is one of the 7 children there who love spending time together. The whole area is their playground: there are no boundaries, no Keep Outs. They’re allowed to play, to be children and use their imagination, thanks to the absence of that present-day menace to kids – traffic. It’s 1928 and we don’t see any motorized vehicles in either of the films. That explains the peaceful atmosphere and the slow pace of life in Bullerbü. We don’t see any ‘phones (I mean landlines) or screens at all in the films. That’s because even blurry black and white television was still a full 25 years away from entering people’s homes. A few households did have telephones in those days. We get to watch a simple life of fun in 1920s Sweden with no smartphones, no Hello Kitty, no Sponge Bob. The kids have to actually look for interesting things rather than having them flash up on a screen. However much my daughter values her smartphone, she’d be happy to leave it at home to spend time exploring this beautiful setting. I enjoy some fast-moving kids’ films, especially the hectic cartoon “Turbo”, about the racing snail! But often the editing in modern films is so fast that it can be over-stimulating for small kids, especially at full volume in the cinema. 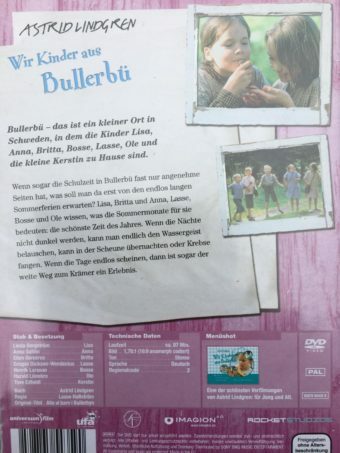 In the Bullerbü films we follow the kids’ games and the funny tricks they play on each other. The characters are all likeable apart from scary Herr Nett, the blacksmith who is not at all “nett” to the kids. He’s the essential difficult character who adds a bit of a challenge. The gentle local schoolteacher lives above the schoolroom – perhaps a tradition from Astrid’s own school days around the year 1916 or so. The main person needing help is Grandfather, who is losing his sight and is loved and respected by the kids. He tells them about his own childhood and gives the family a sense of continuity. In this first film we follow the kids through their summer holidays. As in all the best children’s adventures, like the Famous Five, adults are given a minor role so that they can’t get in the way and spoil any of the adventures. The kids can spend time outdoors just as easily as indoors in this Swedish summer when it hardly gets dark. They help out with farm work. They spend one night sleeping in a barn. There’s plenty of harmless teasing between the boys and girls. The boys scare the girls with stories about the “Wassergeist”(water spirit) at the mill and persuade them to go there with them and see for themselves…They happily swim in the lake and roam in the fields. There’s the story of how Ole gets a dog. It’s a story of friendship and people who still feel connected to nature. I can imagine watching this film on the big screen at the cinema, then feeling shocked to emerge back into city life. Lisa is now 8 years old, and the summer holidays have just come to an end. In this film we see the children enjoying the changing seasons and celebrating Christmas and Easter Swedish style. The children are excited as Christmas approaches, and even more excited when they’re sent home from school in the middle of a snow storm…. We watch them bake traditional Christmas biscuits together and even make sausages. The family chooses a tree in the woods and cuts it down to take home and decorate. Christmas presents are simple: we spotted an orange, a doll, a toy trumpet, and some fabric to use for sewing. The extended family sing songs together and dance around the tree. They travel to Tante Jenny’s house by horse and sleigh through the snow. Christmas in Bullerbü is a magical time. The film wouldn’t be telling a proper story if there wasn’t a problem in the middle somewhere. One of the boys, Lasse, provides this when the children go ice-skating on a pond near Tante Jenny’s. He gets over-confident and strays over to an ice hole. He falls into the hole and tension mounts as they struggle to get him out of the freezing water…. New Year’s Eve 1928 is marked by the tradition of “Bleigiessen” (lead pouring) where the children each get a small piece of molten lead, it solidifies then the others have fun “interpreting” the resulting shape to predict what the year might have in store for that person. 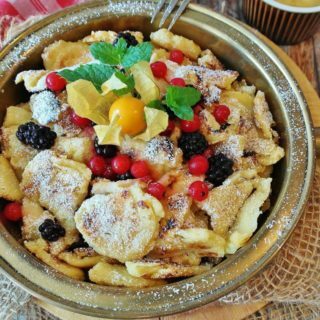 The kids have fun on April Fool’s day and in Spring we find out about Swedish Easter traditions. Also in Spring Lisa takes a lamb into school. Like the first film, this is a charming story of childhood. There’s not much high drama but there’s a lot of friendship and happiness found in simple, natural things. Just when I was thinking about writing this post I found this article: “Badger or Bulbasaur – have children lost touch with nature?” in The Guardian, by the travel and nature writer Robert Macfarlane. He thinks many children and adults are losing touch with nature. Cambridge researchers found that primary kids knew more Pokemon characters than they did common species of wildlife such as bluebells, herons and wrens. Is nature just becoming a green backdrop? He points out that the “roaming range” for kids has dropped 90% in 40 years. He suggests that the causes are traffic, increased screen time, homework, parental worries and a reduction in green space to play in. Physical and mental health are affected. People won’t be concerned about the extinction of faraway birds if they can’t identify the ones at home. Organizations such as Forest Schools are trying to reverse the trend. It’s true that new technologies are at the centre of children’s (and adults’) lives, and I’ve heard smartphones described as “second brains”. But I think technology can actually help with “nature deficit” if it’s used as a tool rather than as a main focus. I’ve listened to bird song on the computer and used a smartphone to identify a stag beetle. This sounds like the sort of thing my children would enjoy. Do you know if it’s accessible to English-speakers at all? Either the book, or films? You made an interesting point about Pokemon and the great outdoors. I was shocked to discover that my two didn’t recongnise foxgloves, when we were in Scotland – and yet my son can reel of hundreds of Pokemon characters. I’d never seen an English version of the book or the film mentioned anywhere, Nell. You’ve inspired me to look further and I’ve just found the books here: https://www.amazon.co.uk/Children-Noisy-Village-Astrid-Lindgren/dp/0192734598/ref=sr_1_1 These are quite new editions and they’ve even named the translator on the front. And Tony Ross has done the illustrations! No sign of an English version of the film, unfortunately. I wonder if it exists somewhere? Funny that they’ve called Bullerbue “Noisy Village”! It’s so peaceful. Could be ironic, but maybe in those days they did think the kids were noisy. 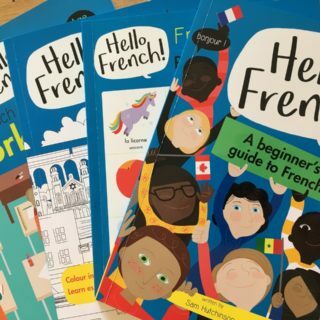 If you do get the book let me know what your children think! I hope they (and you) enjoy it. …and now I’ve edited the post to include the English version of the book! But there’s no sign anywhere of an English version of the film.